Naming storms in Britain and Ireland | Notes from the U.K. The Met Office, weather forecasters to the U.K., has started naming storms. We’re not talking about hurricanes, just storms big enough to stand out. The idea is that if they have names the public will take more notice of them, and presumably of the danger they pose, and I’d love to make fun of that but as far as I can tell it works. Sad, isn’t it, not to make fun of something just because it’s sensible? When I started writing this, we were waiting for storm Frank to hit. That means I wasn’t just sitting around waiting for some nameless storm, I was waiting for something with more definition than a bunch of unnamed isobars, however tightly packed, on a weather graphic. Frank didn’t pose any particular threat this far south, but we were expecting a bit of drama and I’m a sucker for finding out what’s going to happen next. Without the name, though, I’m not sure I’d have been so consciously keeping an eye out for it. 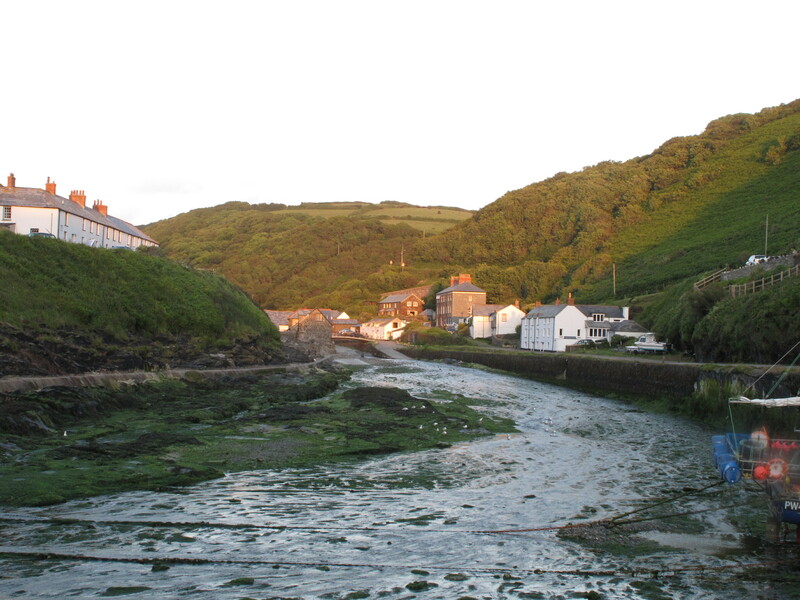 Borderline relevant photo: Boscastle in the evening–and more to the point summer–light. Back when I lived in Minnesota, we didn’t have an official naming system for storms, but a few got themselves named anyway, and those names give me a hook to hang my memories on. The Superbowl Blizzard hit during a major football game. I never watch football—I have a serious sports allergy and, sorry folks, I just can’t—but the name means the storm has stayed well defined in my memory. I doubt an unnamed storm would be. The weather had been spookily warm just before the blizzard, and it rained. Then the temperature dropped so quickly that water froze in the storm drains and on the streets. That was followed by a heavy snow, which (do I even need to say this? oh, why not?) fell on top of the ice. The driving was lethal and the walking wasn’t much better. I was driving cab at the time and had a sort of roommate (we rented a house that split neatly into two apartments, hence the sort of) whose brother came over to get snowed in with us. Minnesotans do that, at least at a certain age. In the morning, none of our cars started—it was too cold. let’s say it was 30 below, but understand that I’m inventing the number. Think of it as a poetic way to say it was brutally cold. I caught a cab to work so I could drive a different cab back and jump all three cars. That’s one of the things about driving cab. No one really knows what you’re doing once you leave the garage. Jumping the cars didn’t help—that’s how cold it was. But by then I’d taken the cab out and there was nothing for it but to put in a day’s work. I don’t remember if I made much money—probably not, because although almost no cabs were on the road and every third person in town wanted to get somewhere without risking their own car, the driving was slow, and you can’t make much if the driving’s slow. Still, I remember that day’s work as sublime. Snow brings a special kind of silence to a city, and a sense of gentleness. I passed a man skiing down Cedar Avenue near Lake Street. Almost no one was around except for him and me and one car, stopped at a red light. In a heavy storm, Minneapolis normally begins clearing and salting the major streets even before the snow stops falling, but the storm had overwhelmed them. The streets that had been plowed were as icy as the ones that hadn’t been. The few cars that were on the streets moved in slow motion, because the only way to stop on ice is very, very slowly. What accidents I saw happened equally slowly, almost as if we were all wrapped in cotton wool. Would I remember that as clearly if the storm didn’t have a name? The images would still in my head, but I doubt I’d remember that they were from that same storm. The other named storm that hit Minnesota while I lived there was the Great Halloween Blizzard, which hit before any small storms had given the city a reason to salt the streets. That meant the pavement hadn’t built up a salty residue. (I should admit that the city stopped using actual salt years before this period, but let’s call it salt. It sounds better than non-specific ice-melting chemicals.) So we had a wet, heavy snow hitting bare asphalt and welding itself to it. The first layer of snow packed down to a thick layer of ice, then more snow piled up on top of it. Again, the city was overwhelmed by the storm. And again, the temperature dropped dramatically. Coming so early in the season, the whole thing took people by surprise. A student in a writing class I taught told me he lost two lawn chairs and a lawnmower under the snow. He’d taken a break in his mowing and—well, I don’t know how long the break was but by the time he went back out it was pretty clear that he wasn’t going to finish the lawn until spring. By which time I doubt he’d be using the mower he started with. They were so outrageous about it, and so damned cheery, that I gave them almost all the candy in the bowl, keeping only a few bits of in case they were wrong. When the city finally plowed and salted, instead of clearing the streets they made potholes in the ice, and cars crept and bounced through rush hour after rush hour. It was weeks before traffic started moving normally. I’d remember the storm even without a name because it hit the same day that my 90-year-old father was hospitalized in New York with meningitis. It was days before I could get out of Minneapolis to see him. (He did recover.) But if the storm hadn’t found its own name, I’d have remembered it with a more private name—the Storm When Dad Got Meningitis. That’s a testimonial to the power of names, and to our need for them. Which brings us back to this current naming project. The U.K. and Ireland are collaborating on it, since the two countries are parked in the Atlantic like a car and a truck, and if a storm hits one it’s likely to hit the other next. Collaboration strikes me as significant, because British weather forecasts ignore the Republic of Ireland. They tell us what the weather will be for Northern Ireland, but across that border into the Republic? Silence. It’s as if Britain’s still sulking that Ireland went independent and by god it’s not going to acknowledge any Irish weather. I don’t notice this so much when I’m listening to the radio. The various regions of Britain get mentioned and I almost never catch the one I’m listening for because either my mind wanders or the puppy starts barking or the oven explodes or the phone rings or, you know, life interferes in one of the many glorious ways it has. But it is noticeable on TV because Ireland’s right there on the BBC weather map but no weather ever touches it. Northern Ireland? Yes, it gets wind, sun, rain, all that stuff. But the republic? Nope. It doesn’t have weather. I know the Irish aren’t the BBC’s target audience, but still. I’ve heard France mentioned in weather forecasts. I’ve heard the word Spain. But Ireland? Silence. That must make this collaboration over storm names interesting. Or maybe the word I’m looking for it tense. But even without the BBC’s ban on Irish weather, the politics of naming storms would have to be tricky. How many names will be Gaelic and how many English? Does each country get so many names per head? Do they have to take account of the number of Irish names that are of English instead of Gaelic origin? Or does each country get to pick the same number of names? Will either country acknowledge the presence of immigrants by picking a name from some third or fourth language group? Listen, everything’s political. Breakfast cereal is political. A length of blue ribbon is political. My fingernails are political. Here in Cornwall, Frank didn’t turn out to be anything special. We’ve had so much rain lately that it’s hard to tell one storm from the others. Even the named ones are basically water landing on top of more water. Mercifully, none of them have done worse than leave us wet and wind-blown. But farther north it brought flooding and misery to places that hadn’t recovered from earlier flooding and misery. I’ll have to hear from someone up there to know whether having a name for the storm made them any more aware of it ahead of time or if it only gave them a better way to talk about it. This entry was posted in Weather and tagged Americans in Britain, Americans in England, anglophile, British weather, Halloween Blizzard, Minnesota weather, naming storms, Storm Frank, Superbowl Blizzard, weather by Ellen Hawley. Bookmark the permalink. Morning! I recently blogged on storms and their assigned nomenclature. Great minds think alike! But tell me this, you used to live in MN? I have mad respect for you. It is beyond cold there. Of course I have never been-but one hears things. Plus, I’ve got family living in White Bear Lake, MN (is this really a real name?) so they have told me how cold it gets there. Anyway, I liked the post and great picture too. White Bear Lake’s a real name, with a real place (and I assume a real lake, although I can’t vouch for that) attached. It’s one of the far suburbs of St. Paul. And “beyond cold” really does sum it up. When you try to describe what it’s like, it just about drops off the edge of the English language. But I’m not sure having lived there entitles me to respect. You might be wiser to question my sanity. Massive relief-White Bear Lake is a real place. The weather has turned cold kind of all of a sudden-no doubt people in MN are laughing at us. As for sanity, in my opinion, its terribly overrated. I’ve been here long enough to find myself thinking, It’s cold, then catching myself and revising it to It’s chilly. hah! Sounds sensible. I should do the same-but then what on earth would I complain about? Oh, there’s always something. Honest. I never remember his name, but I did know who you were talking about. Game show. Ladies and Gentlemen. Welcome to … NAME THAT STORM. This week we have Cecil and Clemantine. Great idea. Do they get to wreck the studio? Maybe … but this being Britain they will probably waft gently round the studio and sip cups of tea stylishly. We refer to this as … a storm in a tea-cup. Oh, that’s so terrible that I love it. What a perfect image it’s left in my addled brain. As someone from ‘up North’ I don’t think it made a difference that it had a name. Most people I think just heard ‘more torrential rain and high winds’ and made up their own names – most of which would be unprintable on a nice polite blog such as yours. It does perturb me as to why we Brits are so bad at weather, heavens knows what we’d be like if we had Minnesotan winters! I’m sure you’re right about the names people gave the storms. The trick is to get everyone to agree on one of them, which isn’t an easy task since everyone thinks their form of swearing is sharper and more effective than everyone else’s. The youth of the North don’t bother with jackets, gets in the way of a good night out on the town! The rest of us have our own line of very ridiculous and totally inadequate rainwear. I think most of us agreed the name given to the recent weather began with F. Frank didn’t come in to it unless we are talking the honest and straightforward frankness that it was all very vexing ..
Mmmm, yes, I can see where naming it Frank kind of missed the boat. And I might as well confess that younger Minnesotans refuse to wear hats because–I don’t know, they lose points or something if they do. But those whose brains don’t freeze when they’re in their teens and twenties and who therefore live into a sensible and boring older age–we did. I love reading your blog. I totally get sucked into the side tangents, and start thinking things like ‘this woman has a past like a bottomless pit, she’s lived so many lives and done so many different things/jobs’. And then I wonder if you lived in Minnesota during the same 15 years my sister did, and random memories flash across my mind about my nieces, then living in Michigan’s UP, having ‘competitions’ with their friends back in Minneapolis over who would get snow earlier in October. So, yeah, that bit about getting distracted while trying to listen for today’s weather on the radio? I get that, too. Glad to know it’s not just me with a short weather-attention span. Maybe it’s something about that weather forecaster voice that makes us think of other things. I lived in Minnesota from–wait, wait, I can figure this out–1966 to 2006. Probably. Never trust me on anything involving numbers. But forget accuracy: I was there a long time. So your sister and I were likely to have been there at the same time. Damn, that state’s cold. And you’re right–many lives, many tales to tell. Even more not to tell. Glad you enjoy the blog. It would be interesting to know if her memories of them match mine. Memory’s a slippery beast. This would get on my nerves, if anything, because I imagine you’ll have a lot of instances when you’re waiting on Big Storm Ian to show up and he comes in trickling like…well, like a regular storm. You should start a tally right now on how many times this happens and then send it in to the forecasters so they’ll stop this ridiculousness. Though, knowing your luck, they’d probably just name the next one Ellen. I can see where provoking them might not be the best idea. On the other hand, I’ve never had a storm named after me before…. But not many of them come with a funny accent built in. I could offer that as an extra. Thanks. Even here, where it’s relatively warm (although the temperature just dropped a couple of degrees and we’re all complaining about how cold it is), we’re all longing for a bit of summer. The photo was the best I could do to bring us some. It was great seeing some sun! The sun appears here about a couple of minutes a day here, then the sky turn grey again. That must be hard. Much as I hate cold, I think the lack of light would bother me even more. The darkness makes me evening tired very early, so I like the light parts of the year better. But then it’s the other way around. You don’t realize it’s time for sleep, the darkness never comes or comes very very late. I had not read about the theory that naming the storm makes people prick up their ears and prepare themselves because, even if it does turn out to be a bit of a damp squib, at least one would be prepared for the possibility and could batten down the hatches as much as possible. Lots of mixed metaphors in that sentence. Anyway, I think the job of naming them should be given to children under the age of 8. I bet they would come up with some terrific names. I definitely don’t think we (adult) Scots should be entrusted with the task since we had Hurricane Bawbag after all. Great plan, having children under the age of 8 name the storms. Do adults get veto power? Will we end up with Storm Booger Brain? I should add that I suspect the other reason they started naming them is that it’s just plain fun. I don’t think adults should have veto power. I think we should all be discussing what Storm Poop Pants did to Bob’s fruit trees, don’t you? Gee, I’m so glad I asked. I enjoyed the song but don’t think I have the right accent to sing it at the pub. I’m sad about that but realities are realities. Ha ha ha! Maybe you could compose your own version in New York – Minnesotan – Cornish. The storm I remember that has no name was the blizzard of 1978, which actually seemed like two snow storms. I was living in Queens, NY at the time and I remember the city just attaching plow blades to garbage trucks. Your street was plowed the day your trash was picked up, unless you lived on a main drag. Good luck with the naming conventions. Always a pleasure to visit here. Ah, snark away if you like about distributing hurricanes name fairly between male and female names, but it has diminished playground-level insults by a small but perceptible amount. I’m grateful for the change. I remember those snowplows mounted on garbage trucks from when I was a kid, when they didn’t strike me as strange at all. It was just how the world operated. Then I moved to Minnesota and saw what they called a snowplow. All of a sudden the New York system looked hysterically funny. Sensible, given the amount of snow the city was likely to get, but still very, very funny. Yeah, when you move into the land of real snow, you get an education in equipment. Still, some of those would be way to big to navigate streets in NY. This is really silly, but I never thought about that. I listen to Radio 4 via the internet all the time and have noted the absence of weather reporting for Ireland. It does seem a little ridiculous since I hear reports of big storms, tornadoes, etc., that are here in the U.S. Nevertheless, I love Radio 4 but the shipping forecast continues to stump me although it sounds like poetry in another language. I have managed to sort out a few locations but the rest is total mystery. As for that storm name Frank, frankly I was under-impressed since Frank just seems like an honest but ordinary sort of name. At least two syllables are needed and then it should have a somewhat threatening sound but I cannot think of any right now. I am intrigued though. What will the next one be named? Around here the storms do not have individual names. It is all El Niño, El Niño. I do despair seeing all that excess rain in the UK. Ship it over here to California, will ya? Please. The Shipping Forecast is poetry in another language. It’s apparently relevant only if you’re at sea, but ships and boats these days aren’t dependent on the BBC for their weather–they have far more minute-by-minute sources they can use. I read (don’t ask me where) that Radio 4 keeps it because people on land love it. It’s a kind of cultural monument. So don’t give the content a moment’s thought–just let it bizarre beauty wash over you. I’d pack up some of this rain and send it but postage has gotten so crazy I’m scared to find our what it’ll cost. I thought you’d finally gotten some rain. Is that true? I will continue to enjoy the lovely mystery of the shipping forecast knowing that I have plenty of company. The other Radio 4 thing I have come to love in a strange way is the six beeps before the hourly news. I sit up and take notice like a cat hearing the grind of the can opener or the rustle of dry food. Are the beeps recorded or is the news reader doing it? I suspect the latter is true and I swear I can sometimes hear a little style that sends my own mind off on some jazzy beeps of my own. Also, what would I do without the Woman’s Hour at 2 a.m. when I cannot sleep? On rain: yes, Northern California is getting plenty of rain and snow which is good for the reservoirs but does little to replenish the over-pumped ground water that has dropped ground elevation as much as 15 feet in the San Joaquin Valley. Here on the Central Coast we will get better storms soon. Interesting and important sidelight to the long drought: the hills are having a hard time greening up, probably because of years of reduced seed production. Maybe if every British tourist landing at SFO brought a big bag of water to sprinkle about as they spot Morro Rock while driving down Highway One. Surely Branson would waive baggage fees for such a worthy project! I’m sure he would. We can write and propose it. I do like Radio 4. I only listen to it when I’m cooking or driving, so what I catch is pretty random, but a lot of it is good. I’m pretty sure that’s what they all want to say. Thanks for that. All of those Minnesota storms are a blur to me. We lived in Afton on the St. Croix river, in the woods, up a long, steep driveway. All I remember is falling down while snowblowing that driveway. Over and over and over. I got pretty good at it. Falling down, that is. The idea of the UK and all of Ireland naming storms together sounds like a drunken dare in a pub. Ah, yes, falling down on the snow, on the ice, on snow that’s hiding ice. You’re making me so nostalgic for Minnesota. Stop that. I checked and the Superbowl Storm was the one I personally recall as the Winter We Jumped Off the Roof. It was 1975 and I was 8. It snowed so hard, school closed for a week. We couldn’t get out of our driveway–which was nearly the length of a football field and never got plowed. We kids had to shovel it. There was so much snow, the banks reached to the low eaves of the roof of our house. So, being bright children, we decided this made it safe to climb up and jump off. When we landed, the snow would nearly entomb us. We had to rock back and forth to get out of the grave we’d plunged ourselves into. Then we’d stumble back to the ladder to repeat the action. It is just a good thing we didn’t consider diving headfirst! It’s an even better thing that you all survived. Shoveling that driveway must’ve been hellish. I can remember shoveling our front walk and sidewalk–both narrow and neither of them particularly long–in many storms and getting to a point where I didn’t know where I’d throw the next shovelful of snow. Lobbing it up past about elbow height is hard. Not that I need to tell you that. Thank you for this cool information. We just had a nasty blizzard over the weekend where the snow stuck to the side of the house and continued to cling, even when the storm was over. The snow was light enough to sweep off the porch. I assumed a wet snow since it stuck to the side of the house, but if it was light enough to sweep off the porch that sounds fairly dry. So a wet dry snow. No wonder if was nasty. Weirdly the worst hurricanes are the same name as myself and my partner, my mum is the most intense cyclone, and my dad is the longest lasting hurricane. If they ever name a hurricane after my son then the end of the world is here. You’re a dangerous family. I hope you give any new neighbors fair warning. They’ve gone past C already, so they’ll have to save that for the second time they go through the alphabet. But when it comes we will have been warned and will hide in the basement. Oops. We don’t have a basement. We’ll stand on the cliffs facing north and blow really hard so it hits Wales instead of us. I hope you’re right, but I just read that they’re skipping Q, U, W, X, Y, and Z, so the alphabet just got shorter. The winds here today are really incredible. I may weight the dogs down with rocks next time I walk them. I wonder why? what’s wrong with Queenie, Uriah, Wendy… er …Xylophone, ,Yolanda and Zak? Winds here are howling around the house and the waves are tremendous. I wouldn’t go out if I were you, Ellen. You’ll all be blown away. I think they’re afraid of what happens when they have to go through the alphabet for the third or fourth time. In Minneapolis, where I used to live, some of the avenues are alphabetical, and some of the suburbs have a second alphabet. One has a third. The names out there get a little strange (Xenia, anyone? ), and they weren’t limited to people’s names. Good advice, but the dogs insisted on going out and we all survived. We even found a few other hardy dog walkers out there. We’re all crazy. It’s strange how different countries name their roads/ streets/avenues. We must have a Station Road in every village/ town and city. And then there are all the roads called after cities! Glad you got back in one piece – still blowing out there. Just when I thought the winds had settled down, they seem to be picking up again. No lack of drama this winter. Oh, dear, what have I done. Do send him my best wishes for his recovery. Yes, it was still Imogen. Apparently the winds were almost into hurricane territory. The whole world will never be the same, then. And that may well be a good thing.